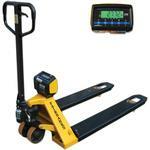 Pallet Jack Scales -- These digital pallet truck scales are rugged, dependable and ideal for accurate weights. 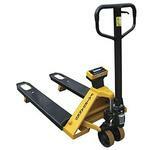 The Pallet Jack Scales have been designed for use in rugged areas such as shipping docks, warehouses, and piecework production lines. By incorporating one of the pallet jack scales into your daily operations, you will be guaranteed an accurate weight reading of 0.1% of the applied load. Using one of the pallet jack scales below during routine handling operations allows for time savings over moving materials to a central scale and then to a final destination. more .. more .. more ..
47.5" x 27" 47.5" x 27"